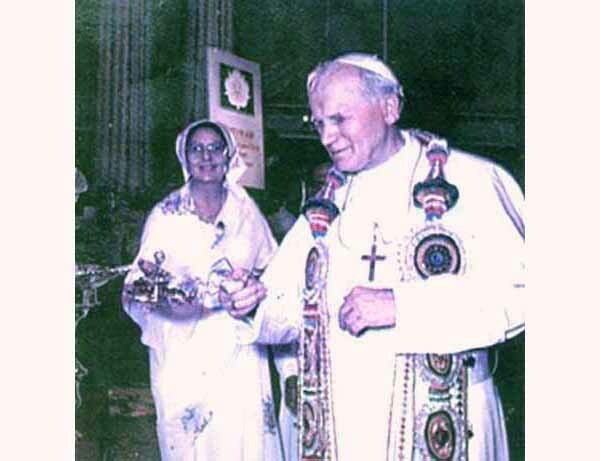 On February 5, 1986, John Paul II lit a candle as part of a Zoroastrian religious ritual. This ceremony took place in the city of Chennai (Madras for the Zoroastrians) in India. Zoroastrism, founded by Zoroaster, is an ancient Persian religion that adores the sun and the fire. Its origin goes back as far as 500 years before Our Lord. It is considered the source of astrology and magic. It was the religion of Babylon when the Jews were captives there. It seems that the vision Ezekiel received from God during that captivity, which showed 25 priests adoring the sun inside the Temple (Ez 8:16), refers to an act of idolatry inspired by Zoroastrism, the dominant religion. God qualified that act as an abomination, and severely punished the Jewish People for their participation, as can be read in the episodes described by the Prophet. John Paul II repeated what can be seen as an analogous crime by participating in this cult of the fire, lighting a candle alongside Dr. Meher Master Moos, above left, the most influential representative of Zoroastrism at the time. The Pope also wore a stole with symbols inspired by that pagan mythology. 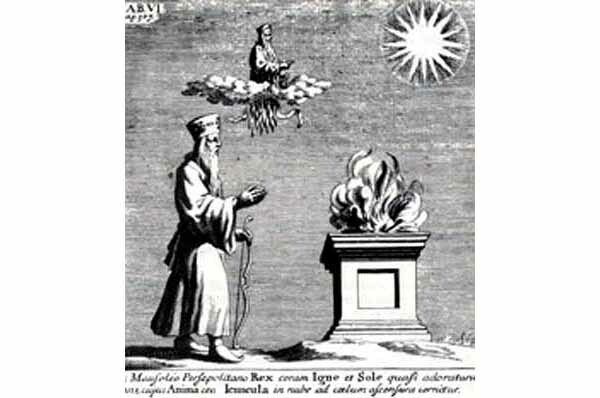 Below, Zoroaster adoring the fire, Adar, always burning on the altar inside the temples of that religion. The adoration of fire is part of the cult of the sun, considered a divinity.